On kickoffs, the clock will not start until the ball is touched in the field of play. On change of possession, the clock will not start until the snap. The attempt to reduce the time of games sought by those rules was successful, reducing the average college football page from 3:21 hours in 2005 to 3:07 hours in 2006. However, the reduced game time also reduced the average number of plays in a game by 13, 66 fewer offensive yards per game and average points per game by 5. Moving the kick-off yard-line from 35 to 30, which matches the yard-line used in the National Football League from 1994 to 2010, to reduce the number of touchbacks. Paring the 25-second play clock to 15 seconds after TV timeouts. Team time-outs for televised games are shortened from 60 seconds to 30 seconds. Allowing penalties against the kicking team on kickoffs to be assessed at the end of the runback, avoiding a re-kick, also matching the NFL rule. Once the umpire gives the ball to the kicker, the 25 second play clock starts. Kickoffs out of bounds are now penalized 35 yards from the spot of the kick or a re-kick with a five-yard penalty. Defenders cannot use any part of a teammate to jump over an opponent to block a kick. The only change in conference membership for the 2007 season occurred when Temple left its Independent status to become the 13th member of the Mid-American Conference. No teams upgraded from Division I FCS, leaving the number of Division I FBS schools fixed at 119. The 2007 season was highlighted by the remarkable frequency with which ranked teams fell to lower-ranked or unranked opponents, leading the media to dub the season as the "Year of the Upset". An unranked or lower-ranked opponent defeated a higher-ranked team 59 times over the course of the regular season. Teams ranked in the top five of the AP Poll were defeated by unranked opponents 13 times during the regular season, setting a new record in the history of the AP Poll when at least 20 teams were ranked. The only other season to see more such upsets was 1967, which was one of seven seasons when the AP Poll ranked only 10 teams. The chaos began on the first weekend of the season when FCS program Appalachian State defeated #5 Michigan on the road at Michigan Stadium in what was immediately hailed as one of the greatest upsets in the history of college football. Appalachian State became just the second FCS team to defeat a ranked FBS opponent, and the first to do so against a top-five team. Stanford defeated #2 USC, 24–23, on October 6 at Los Angeles Memorial Coliseum. This result was particularly notable for the fact that USC was favored to win the game by 41 points, having carried winning streaks of 35 games at home and 24 games in Pac-10 play into the matchup. Both streaks ended with this loss. Oregon State defeated #2 California, 31–28, on October 13 at California Memorial Stadium. Rutgers defeated #2 South Florida, 30–27, on October 18 at Rutgers Stadium. Florida State defeated #2 Boston College, 27–17, on November 3 at Alumni Stadium. Arizona defeated #2 Oregon, 34–24, on November 15 at Arizona Stadium. #3 Missouri defeated #2 Kansas, 36–28, on November 24 at Arrowhead Stadium in a Border War rivalry game. This was the only such upset where the winning team was also ranked. Pittsburgh defeated #2 West Virginia, 13–9, on December 1 at Mountaineer Field in a Backyard Brawl rivalry game. West Virginia was knocked out of contention for the BCS National Championship on the final weekend of the regular season. #1 LSU lost to Kentucky 43–37 in three overtimes, and #2 California lost to Oregon State 31–28 on October 13. #1 LSU lost to Arkansas 50–48 in three overtimes on November 23, and #2 Kansas lost to #3 Missouri 36–28 on November 24. #1 Missouri lost to #9 Oklahoma 38–17 in the Big 12 Championship Game, and #2 West Virginia lost to Pittsburgh 13–9 on December 1. Note: In the Mid-American Conference, only division games count toward the divisional championship. Rankings indicate position in final 2007 AP Poll. All games were played on December 1, 2007. Rankings reflect the Week 14 AP Poll before the games were played. Cornerstone Bancard Hula Bowl – January 12, Aloha Stadium, ʻAiea, Hawaiʻi – ʻAina (East) 38, Kai (West) 7. East–West Shrine Game – January 19, Robertson Stadium, Houston, Texas – West 31, East 17. Under Armour Senior Bowl – January 26, Ladd–Peebles Stadium, Mobile, Alabama – South 17, North 16. † Winner of the Bowl Challenge Cup – § NCAA record for bowl victories in a conference in one bowl season. The Sun Belt Conference, represented by Florida Atlantic University, was not eligible for the Bowl Challenge Cup as they only had one bowl berth. Conferences must have a minimum of three bids to be a part of the challenge. Selections were made by the Associated Press. QB: Tim Tebow, So., Florida. RB: Darren McFadden, Jr., Arkansas; Kevin Smith, Jr., Central Florida. WR: Michael Crabtree, Fr., Texas Tech; Jordy Nelson, Sr., Kansas State. OT: Jake Long, Sr., Michigan; Anthony Collins, Jr., Kansas. G: Duke Robinson, Jr., Oklahoma; Martin O'Donnell, Sr., Illinois. C: Steve Justice, Sr., Wake Forest. TE: Martin Rucker, Sr., Missouri. All-purpose: Jeremy Maclin, Fr., Missouri. K: Thomas Weber, Fr., Arizona State. DE: Chris Long, Sr., Virginia; George Selvie, So., South Florida. DT: Glenn Dorsey, Sr., LSU; Sedrick Ellis, Sr., USC. LB: Dan Connor, Sr., Penn State; James Laurinaitis, Jr., Ohio State; Jordon Dizon, Sr., Colorado. CB: Aqib Talib, Jr., Kansas; Antoine Cason, Sr., Arizona. S: Craig Steltz, Sr., LSU; Jamie Silva, Sr., Boston College. P: Kevin Huber, Jr., Cincinnati. ^ Western Kentucky University was in a 2-year process of transition to FBS status in 2007 (completed in 2009), and, therefore, some sources list the total for 2007 as 119. ^ a b c d e f g h i Steve Wieberg (February 14, 2007). "NCAA rules committee proposes reworking football time-saving rules". USA Today. Retrieved February 15, 2007. ^ "In the Year of the Upset, memorable moments were plentiful". ESPN. December 4, 2007. Archived from the original on January 15, 2008. Retrieved February 28, 2008. ^ "Illinois shocks top-ranked Ohio State in Columbus". ESPN. Associated Press. November 10, 2007. Archived from the original on November 12, 2007. Retrieved November 10, 2007. ^ Brown, Matt (2017-06-23). "10 years later, 2007 CFB season looks even crazier". Sports on Earth. Retrieved 2017-07-11. ^ "Johnson's 2 TDs lead Utah to seventh straight bowl win". ESPN. December 20, 2007. Archived from the original on December 29, 2007. Retrieved December 21, 2007. 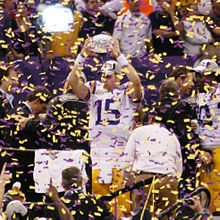 ^ "LSU's Dorsey beats out OSU's Laurinaitis for Nagurski award". CBS Sportsline. Archived from the original on December 6, 2007. Retrieved December 3, 2007. ^ "Razorback Jonathan Luigs Wins Rimington Trophy" (Press release). University of Arkansas Athletics. December 6, 2007. Archived from the original on January 24, 2010. Retrieved December 6, 2007. ^ "Texas center Griffin wins Draddy Award as top scholar-athlete". CBS Sportsline. Archived from the original on February 2, 2013. Retrieved December 4, 2007. ^ "Virginia's Long wins Hendricks Award with 60 percent of vote". CBS Sportsline. Archived from the original on December 7, 2007. Retrieved December 5, 2007. ^ "Tulsa QB Smith wins award for academic, athletic achievements". CBS Sportsline. Archived from the original on September 12, 2012. Retrieved December 4, 2007. ^ "Mangino honored for leading Kansas to dramatic turnaround". ESPN. Associated Press. December 19, 2007. Archived from the original on December 30, 2007. Retrieved November 20, 2007. ^ "Kansas' Mark Mangino Named 2007 Walter Camp Coach of the Year" (Press release). Walter Camp Foundation. Archived from the original on June 10, 2008. Retrieved December 11, 2007. ^ "Buckeyes defensive coordinator wins award for top assistant". CBS Sportsline. Archived from the original on September 12, 2012. Retrieved December 4, 2007. ^ "Tebow, McFadden, Smith on AP All-America first team". ESPN. Associated Press. 2007. Archived from the original on December 23, 2007. Retrieved December 14, 2007. ^ "Official 2007 NCAA Division I Football Records Book" (PDF). NCAA. Archived from the original (PDF) on September 30, 2007. Retrieved November 11, 2007. ^ "Woodson tosses 5 TDs, loses interception-free streak as UK cruises". ESPN. Associated Press. September 29, 2007. Retrieved December 31, 2007. ^ "Kentucky's Woodson breaks record for passes without INT". ESPN. Associated Press. September 22, 2007. Retrieved December 31, 2007. ^ "Louisville forces 5 turnovers in 29–10 win over N.C. State". ESPN. Associated Press. November 30, 2007. Retrieved September 29, 2007. ^ After Woodson's interception-free streak ended against Florida Atlantic on September 29, he attempted three more passes without being intercepted. In the Cats' following game on October 4 against South Carolina, he made 14 pass attempts without an interception before being intercepted in his 15th attempt. The official Kentucky football site has posted detailed play-by-play of both the Florida Atlantic Archived March 2, 2008, at the Wayback Machine and South Carolina Archived March 2, 2008, at the Wayback Machine games. ^ Woodson's record-setting streak of pass attempts without an interception began on November 4, 2006 against Georgia. In that game, he was intercepted early in the second quarter. He then attempted and completed seven passes before being intercepted for the second time in the quarter. His next pass attempt began his interception-free streak. The official Kentucky football site has a detailed play-by-play of this game Archived March 2, 2008, at the Wayback Machine. ^ Before the 2007 season, the record was 329 by Damon Allen of Cal State Fullerton, spanning the 1983 and 1984 seasons. ^ "McFadden honored by SEC after record-breaking weekend". ESPN. November 5, 2007. Archived from the original on November 8, 2007. Retrieved November 11, 2007. ^ "McFadden and Jones Break NCAA Record for Combined Rushing Yards". University of Arkansas Athletics. Archived from the original on May 17, 2011. Retrieved December 13, 2007. ^ a b "Football: UNT can't stop Navy in record-setting shootout". Denton Record-Chronicle. November 11, 2007. Archived from the original on November 12, 2007. Retrieved November 11, 2007. ^ "Narrow victory sets NCAA mark, ties ACC record". The Virginian-Pilot. November 4, 2007. Archived from the original on November 12, 2007. Retrieved November 19, 2007. ^ "Maclin sets single-season freshman record for all-purpose yards". ESPN. Associated Press. November 17, 2007. Archived from the original on November 19, 2007. Retrieved December 2, 2007. ^ a b "Brennan sets passing TD mark to claim Hawaii's first outright WAC title". ESPN. Associated Press. November 24, 2007. Archived from the original on November 26, 2007. Retrieved November 24, 2007. ^ "Patrick runs for career-best 202 yards, 2 TDs as OU rolls". ESPN. Associated Press. November 24, 2007. Archived from the original on November 26, 2007. Retrieved November 24, 2007. ^ "Carmody's late field goal lifts Cardinals over Scarlet Knights". ESPN. Associated Press. November 30, 2007. Archived from the original on December 1, 2007. Retrieved November 29, 2007. ^ "Tulsa can't contain Smith as UCF clinches first C-USA title". ESPN. Associated Press. December 1, 2007. Archived from the original on December 4, 2007. Retrieved December 1, 2007. ^ "Off and Running". ESPN. Associated Press. December 9, 2007. Archived from the original on December 24, 2007. Retrieved January 3, 2008. ^ a b "Smith's 14th straight 300-yard game leads Tulsa past Bowling Green". ESPN. Associated Press. January 6, 2008. Archived from the original on January 10, 2008. Retrieved January 7, 2008. ^ Hoeppner, who had previously announced plans to take the 2007 season off for medical reasons, died of a brain tumor on June 19. ^ "Sources: Nutt out as coach, will receive settlement from Arkansas". ESPN. November 26, 2007. Archived from the original on November 28, 2007. Retrieved November 26, 2007. ^ "Nutt turns down offer to remain Razorbacks coach". ESPN. Associated Press. November 26, 2007. Archived from the original on November 28, 2007. Retrieved November 26, 2007. ^ "Sources: Petrino leaving NFL for Arkansas job". ESPN. December 11, 2007. Archived from the original on December 13, 2007. Retrieved December 11, 2007. ^ Durante, Joseph (November 8, 2007). "Baylor football coach Morriss out in 5th season". Houston Chronicle. Archived from the original on November 11, 2007. Retrieved November 8, 2007. ^ a b "Houston's Briles to take Baylor job". ESPN. November 28, 2007. Archived from the original on November 30, 2007. Retrieved November 28, 2007. ^ "Duke fires Roof after 1–11 finish". FoxSports.com. Associated Press. November 26, 2007. Archived from the original on December 2, 2007. Retrieved November 26, 2007. ^ "Cutcliffe embraces rebuilding opportunity at Duke". ESPN. Associated Press. December 15, 2007. Archived from the original on December 17, 2007. Retrieved December 16, 2007. ^ Schlabach, Mark (November 26, 2007). "Sources: Gailey fired at Tech after six seasons". ESPN. Archived from the original on November 28, 2007. Retrieved November 26, 2007. ^ a b Schlabach, Mark (December 7, 2007). "Johnson accepts offer to become Yellow Jackets coach". ESPN. Archived from the original on December 8, 2007. Retrieved December 7, 2007. ^ Schad, Joe (December 13, 2007). "Source: Houston hires Sumlin, eighth minority coach in FBS". ESPN. Archived from the original on December 14, 2007. Retrieved December 13, 2007. ^ "Michigan coach Carr to step down after 13 seasons with Wolverines". ESPN. Associated Press. November 18, 2007. Archived from the original on November 20, 2007. Retrieved November 18, 2007. ^ a b "Rodriguez leaving West Virginia to coach Michigan". ESPN. Associated Press. December 16, 2007. Archived from the original on December 17, 2007. Retrieved December 16, 2007. ^ Neal McCready (November 24, 2007). "Orgeron fired at Ole Miss". Alabama Press-Register. Archived from the original on March 8, 2012. Retrieved November 24, 2007. ^ "Nutt moves quickly to Mississippi". USA Today. November 27, 2007. Retrieved November 27, 2007. ^ Schad, Joe (November 24, 2007). "Source: Interim Nebraska AD Osborne fires Callahan". ESPN. Archived from the original on November 26, 2007. Retrieved November 24, 2007. ^ Sherman, Mitch (November 29, 2007). "NU Football: Osborne is interim head coach". Omaha World-Herald. Archived from the original on September 23, 2008. Retrieved November 29, 2007. ^ "Nebraska chooses LSU assistant Pelini as new coach". ESPN. Associated Press. December 2, 2007. Archived from the original on December 4, 2007. Retrieved December 2, 2007. ^ Willhite, Lindsey (November 26, 2007). "NIU coach Joe Novak is retiring". Daily Herald. Retrieved November 26, 2007. ^ "Huskies hire former coach of year from Southern Illinois". ESPN. Associated Press. December 13, 2007. Archived from the original on December 14, 2007. Retrieved December 13, 2007. ^ Hairopoulos, Kate (October 28, 2007). "SMU fires football coach Phil Bennett". Dallas Morning News. Archived from the original on October 29, 2007. Retrieved October 28, 2007. ^ Sherman, Mitch (January 8, 2008). "Agent: Jones leaving Hawaii, agrees to be SMU coach". sportsline. Archived from the original on January 9, 2008. Retrieved January 8, 2008. ^ Schlabach, Mark (November 26, 2007). "Sources: Bower won't return for18th season at Southern Miss". ESPN. Archived from the original on November 28, 2007. Retrieved November 26, 2007. ^ Allen, Robert (December 11, 2007). "It's Official Now, Fedora to Southern Miss". Scout.com. Archived from the original on December 14, 2007. Retrieved December 12, 2007. ^ "Embattled A&M coach resigns after 5 rocky seasons". ESPN. Associated Press. November 23, 2007. Archived from the original on November 26, 2007. Retrieved November 23, 2007. ^ Davis, Brian (November 24, 2007). "A&M defensive coordinator Gary Darnell named interim head coach". Dallas Morning News. Archived from the original on November 27, 2007. Retrieved November 24, 2007. ^ Brian Dohn (December 3, 2007). "UCLA fires coach Dorrell". Los Angeles Daily News. Archived from the original on December 5, 2007. Retrieved December 3, 2007. ^ "Former UCLA quarterback Neuheisel named head coach". ESPN. Associated Press. December 29, 2007. Archived from the original on January 1, 2008. Retrieved December 29, 2007. ^ Smith, Craig (November 26, 2007). "WSU fires head coach Doba". The Seattle Times. Archived from the original on November 28, 2007. Retrieved November 26, 2007. ^ "Wulff returns to Pullman to coach alma mater". sportsline.com. December 11, 2007. Archived from the original on December 13, 2007. Retrieved December 11, 2007. ^ "Associate head coach to prepare Mountaineers for Fiesta Bowl". ESPN. Associated Press. December 18, 2007. Archived from the original on December 29, 2007. Retrieved December 19, 2007. Wikimedia Commons has media related to 2007 NCAA Division I FBS football season.